And don't forget to look at our great variety of Premium Feeds, Standard Feeds and Elite Specialties! Our Suet products use quality ingredients that provide ultimate nutrition for birds and fantastic backyard bird watching. 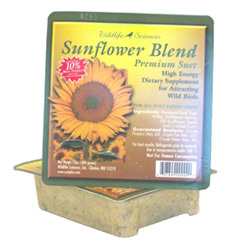 Suet, made from high quality beef fat, is a fantastic bird feed because it is a highly concentrated energy source. Many insect eating and tree clinging birds, along with many other birds (specifically while nesting), appreciate and benefit from the tasty, protein filled feed. Customers will find this line of products attractive because of their innovative feeding options, environmentally responsible packaging and vivid and informative graphics. These are great “impulse buy” items. 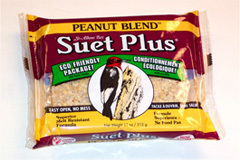 Suet Plus are individual cakes that come in easy-open, environmentally friendly packaging. The candy-bar style wrapper makes handling easier and less messy. Premium Suet Cakes are made with the same high quality ingredients as other Suet products, but they come in these more specialized bird flavors. Suet Balls and Suet Plugs are designed to fit different style feeders. Feeders tend to be more versatile and decorative. Here is an excellent opportunity to offer you neighborhood birds a bit of variety.